Fifteen years have passed since Indonesia embarked on reformasi following the fall of Soeharto in 1998. 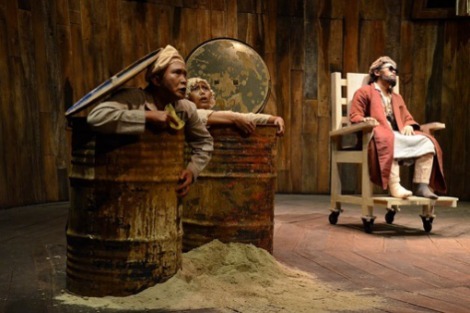 That year a Yogyakarta theatre company performed Samuel Beckett's Endgame to mark the end of the old dictator and to challenge Indonesian audiences to reflect on the absurdity of the long Soeharto years. Not only had Soeharto clung to political life like the play's central character, the wheelchair bound, overbearing and blind tyrant Hamm, but also like Hamm he had disabled much of Indonesian life around him. The director also conceded, however, that there are bright spots amid the everyday insanity and cause for 'sober optimism'. I agree. Despite all the challenges, Indonesia is a far better place than when I first visited in 1969, just after Soeharto took over, and again today, 15 years after his departure. Reformasi has not delivered in many ways; impunity prevails and serious issues such as Papua are being mismanaged. Indonesia has not seen 1000 flowers bloom but its garden hosts some attractive blooms and its spring has been much better news than the transitions in the Middle East. In particular, the general sense of openness, creativity, and freedom that exists is a very distinctive and refreshing change from the old days when basically only one man, Soeharto, enjoyed freedom of opinion, expression and assembly. Many examples in support of this sober optimism can be given. That a politically charged Endgame could be produced and discussed publicly is itself evidence of this change. Positive Indonesian reaction to the recent speech to the UN by the young Pakistani Muslim girl Malala is another. A leading Jakarta paper strongly endorsed her calls for education especially for girls, while pointing out that the number of female students at Indonesia's top universities exceeds that of males. It also called for an end to remaining book censorship laws in Indonesia and reminded readers that both Sukarno and Soeharto adopted what it called 'the Taliban way' regarding books, burning and banning texts and imprisoning writers 'because the government loathed differences of opinion or ideas'. In the context of Malala's advocacy, another striking example of ongoing reformasi is the reform of the school system currently being undertaken in Indonesia. As Indonesia has the long break mid-year like Europe, the new school year has just commenced. It has attracted more than usual comment because, in addition to increasing compulsory schooling from nine to 12 years and injecting more funding into education, the government is trialling a new school curriculum and methodology. The principal aim of the reform is to 'develop creativity, curiosity, the ability to form questions and to form a critical stance necessary for a well-developed life and for life-long learning'. It seeks to do this by dropping subjects in favour of themes and by integrating learning. First graders, for example, will use eight thematic books in a year, one per month, such us Myself, My Hobbies, My Family, Caring about Creatures. The 'Myself' reader features Udin who, besides his family, has friends like Edo from Papua, Beni from North Sumatra, Lani, an ethnic Chinese, and Siti, a little girl who wears a headscarf. Active learning and self-expression will be stimulated by working together, telling stories, solving maths problems, making up songs and the like. Critics including teachers complain the reform is rushed and that teachers have not been given sufficient time and training in the new approach. Catholic schools say they will not introduce the new curriculum until 2014. There is no doubt that teachers will make or break the initiative. My point, however, is not to elaborate on the new system but to point out what a break it represents with the past. Like Australia's Gonski reforms, Indonesia's initiatives are designed to give its economy a competitive edge by upgrading its human resources. But the changes also have the potential to radically transform Indonesia in other ways. Future generations who have been encouraged to think for themselves, to question and to criticise will be very different citizens to their forbears who have been formed in more doctrinaire traditions — cultural, religious, military and otherwise. May these initiatives also contribute to the ongoing reformasi of Indonesia, including democratisation, and the blossoming of its great potential. Pat Walsh is currently visiting Jakarta. He co-founded Inside Indonesia magazine thirty years ago this year. You can hardly blame the teachers for complaining that the changes to the education system are rushed. The curriculum was released in December last year and represents a massive change from the drill/chalk and talk methodology that has been the hallmark of Indonesian education for decades. Yet it was slated for implementation in July, just over six months later. I work at a local school with an international curriculum and we are constantly visited by local government and private schools and universities looking to see what we are doing and how we do it. But there are a huge number of schools which have no idea about what modern pedagogy is about yet they are expected to implement it without any significant inservice. At my school, an IB school for 10 years, the staff are predominantly Indonesian and it has taken a long time to train them out of the methods that they were taught by and into the inquiry/thematic approach required by the IB. There are two other issues here. The new curriculum is a product of the National Education ministry - the provincial and city ministries don't necessarily see eye to eye with them, which causes significant procedural and political tensions. The other issue is that despite the changes to the curriculum, there appears to be no change coming in the Year 6, Year 9 and Year 12 national exams. These are multiple choice, shallow and often compromised by corruption and many schools spend the last 6 months in those years drilling, drilling, drilling. Unfortunately, as everywhere else (NAPLAN, anyone? ), assessment still drives curriculum and teaching practice. “Future generations who have been encouraged to think for themselves, to question and to criticise will be very different citizens to their forbears who have been formed in more doctrinaire traditions”. ………. We have seen the “Arab spring”, now the Indonesian spring. Perhaps also a beginning of a Catholic spring.? It seems it will need “grass-roots” energy to complement the cautious lead from the top. Interesting and informative article, Pat. ErikH's comments were also most apt. When I was in Indonesia in the early 1970s I saw a country still getting over its colonial and Sukarnoist past. Perhaps Soeharto's long, enervating, corrupt rule was a follow on from that unfortunate past? Indonesian culture and politics were then most strongly influenced by the Javanese, the largest and most powerful ethnic group. Javanese culture is hierarchical to an extent we don't understand in the West. It is also heavily imbued with a syncretic mysticism which was centred round the old royal courts, including Jogya. Interesting Samuel Beckett is big there. He was the playwright of dysfunctionality. The IB is, by and large, a circuit breaker for schools who want to get away from the narrow Ed Dept guidelines. I am unsurprised that Indonesian teachers were/are taught the old "chalk & talk" way. Our new "free form" approach is quite different. Like the old one it has its inherent weaknesses. I think the main purpose of a good education and this distinguishes the Westminsters and Sydney Grammars from the bad schools is that, having provided the basic grounding in Maths; Science; Languages etc. they teach you to think for yourself by providing the appropriate environment. Most Indonesian schools still need basic equipment we take for granted in the West. The best schools, including the best Catholic ones, tend to be both private and expensive. The government schools will, as they are here, always be under pressure to conform to certain views. That will take a long time to change.